NAGS HEAD – It’s been six years since the federal Bureau of Ocean Energy Management proposed siting wind energy production off Kitty Hawk, and now the agency is preparing to actually offer leases in offshore blocks more than 20 miles from the beach. An online auction for the lease sites is expected early next year. Virtually no one at a public information meeting held Wednesday at Jennette’s Pier seemed particularly concerned about the prospect. “This is a really important pivot in the process here,” said facilitator Bennett Brooks, with the Consensus Building Institute. 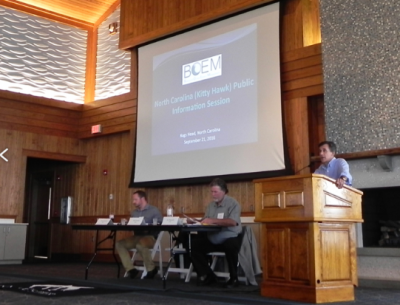 Of the 43 people who attended the session, only one person, Manny Medeiros, a frequent critic of wind energy, spoke out in opposition to wind turbines spinning above the ocean off the northern Outer Banks. 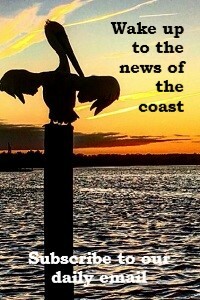 Medeiros, a Kitty Hawk resident and real estate agent who is also a vocal climate change skeptic, claimed that European wind operations are losing money and asked why offshore wind energy is being pursued in the U.S.
“Everyone knows that wind energy is the biggest blunder of our time,” he said. Responding, Jim Bennett, BOEM program manager, said that the U.S. has learned a lot from Europeans’ experience. Shaped like a ragged corner, the proposed 122,405-acre area is located 24 nautical miles from Currituck Beach and about 32 nautical miles from Kitty Hawk. A nautical mile equals about 1.15 standard miles. The wind energy area is the same one that was announced in August 2014, divided into 21.5 blocks, or lease units. Two additional wind energy areas off Wilmington have since been realigned with BOEM plans for South Carolina wind areas. 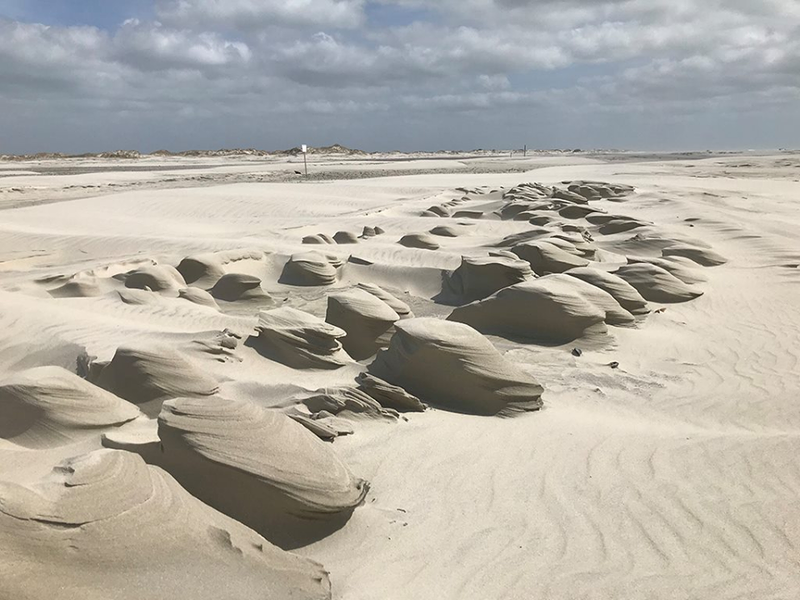 The state Division of Coastal Management is currently evaluating whether the Kitty Hawk project is consistent with state coastal regulations. If a lease is awarded, the developer would be allowed to conduct a site assessment that would determine whether the site would support commercial wind energy development. The assessment would be conducted between 2017 and 2022. Various maps on placards lined the meeting room overlooking the ocean, depicting numerous conflicts with birds, sea turtles, military interests, vessel traffic and fishing. Chatting with people prior to start of presentations, Brian Krevor, environmental protection specialist in BOEM’s Office of Renewable Energy Programs, pointed to one map showing the distance from the shoreline to the closest wind turbines. The row of narrow towers, which could range from 450 to 600 feet in height, would be virtually invisible, he said, especially in the summer when humidity makes the skies hazy. “You theoretically could see it from there, but you’re really at the limits of human visual acuity,” he said. Krevor said that earlier concerns about blighted views and conflicts with vessel travel had been resolved by meeting with stakeholders during the planning process and methodically analyzing options. The current map has been cleared with the Coast Guard and the U.S. Department of Defense, he said. Initial plans had the blocks starting as close as six miles from the beach, but were later adjusted at the town of Kitty Hawk’s request to place them no closer than 20 miles from shore. And the National Park Service’s concern about the project’s proximity to the Bodie Island Lighthouse resulted in another reduction in size. 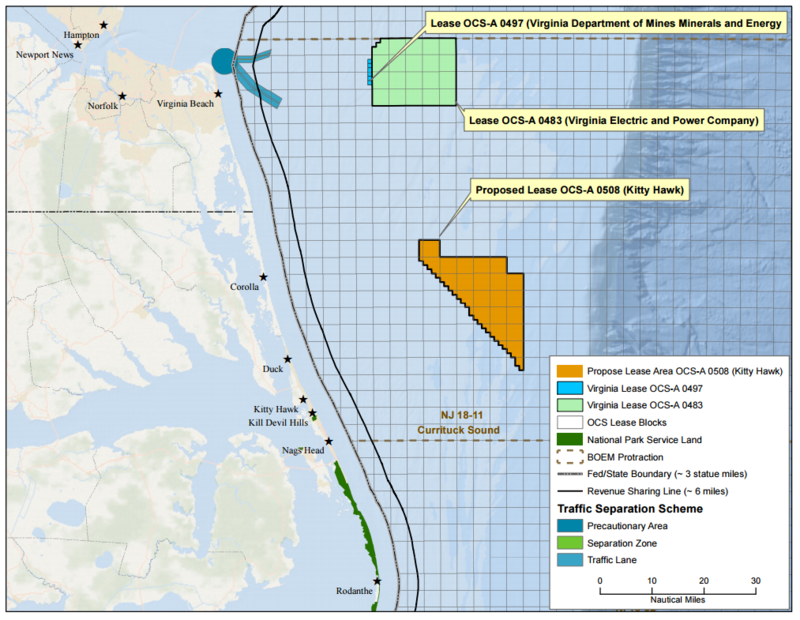 The proposed Kitty Hawk area is situated about 20 miles south of a wind energy lease awarded in Virginia. One person at the meeting questioned the high relative cost of offshore wind, compared with land-based wind and other energy sources. Will Waskes, BOEM project coordinator, said that as the scale of construction of offshore wind goes up, the price of parts and labor can be expected to decrease. “Pretty much everybody is working to drive down that cost,” he said. Ken Jobe, a Beaufort resident with Citizens Climate Lobby, asked about the value and quality of the wind resource off Kitty Hawk. But that is a question with no easy answer, Waskes said. In general, the industry believes that there is good wind data. Specific measurements of wind speeds that would spin turbines high in the air, he said, are not yet available. 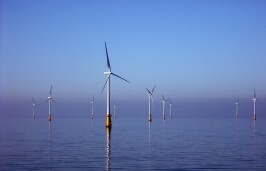 Wind resources would be measured by a contractor after a lease sale is awarded, he said. The developer would tailor the turbine height and type to the resource, and a construction plan would have to be submitted to BOEM for approval. So far, $16 million in lease sales have been issued by BOEM for 11 commercial offshore Atlantic wind facilities, nine of which were competitive – two each off New Jersey, Massachusetts, Maryland and Rhode Island-Massachusetts; and one off Virginia. A five-turbine project off Block Island in Rhode Island, which is mostly in state waters, is set to start operating this fall – making it the first U.S. offshore wind facility to produce energy. Sightseeing tours of the project are already being conducted, according to local news reports. Several BOEM representatives declined to project which offshore wind project will be most likely the next to come online. Lots of factors can come into play, they cautioned, including local support or opposition, legal challenges and regulatory and construction glitches. Specifics about staging equipment and the location of the sub-surface power cable will also be known only after the construction and operations plan that meets regulatory requirements is submitted, Waskes said in answering another person’s question about infrastructure. The proposed lease sale, announced Aug. 12, would be for a single lease that can only be awarded to one entity. But regulations allow the assignment of all or a portion of the lease to other entities. The online auction is anticipated to be held in January or February 2017, with a lease sale to be awarded to the highest bidder. The notice also requests that prospective qualified bidders affirm their interest in offshore commercial wind development off Kitty Hawk. It also allows for additional bidders to submit their qualifications before the Oct. 17 deadline. Public comments will be accepted in the same period. So far, BOEM has qualified five developers to bid on all or portions of the area: Apex Clean Energy, EDF Renewable Energy, Green Sailene, Dominion Power North Carolina and Fishermen’s Energy. A final sale notice, issued after a review period, will be published to announce the date and time of the lease sale. After leases are issued and the construction plan is approved, BOEM will prepare an environmental analysis. The lessee has up to 25 years to develop a plan. 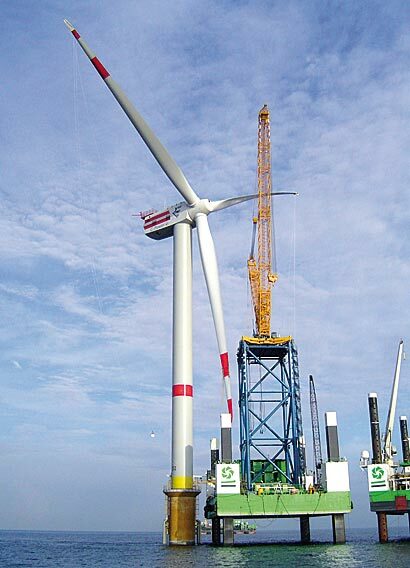 Bennett said that the Kitty Hawk project fits the United States’ strategic vision for increased wind development, while decreasing dependence on fossil fuels to meet the nation’s energy needs. The 60-day public comment period ends Oct. 17 and comments may be submitted by electronically or by mail. Submit comments electronically. In the entry entitled, “Enter Keyword or ID,” enter BOEM-2016-0045, then click “search.” Follow the instructions to submit public comments.